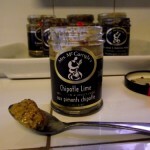 Home » Chef's Corner » Artisan & Specialty Products » Mrs. McGarrigles Mustards. And My Chicken. 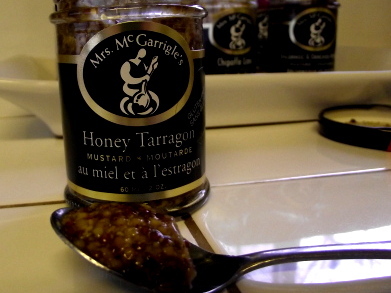 My most recent specialty product comes from Mrs. McGarrigle’s in the form of a box of 6 specialty mustards. Given that I have always been a “Hold the mayo, extra mustard please” kind of gal, I was pretty excited. 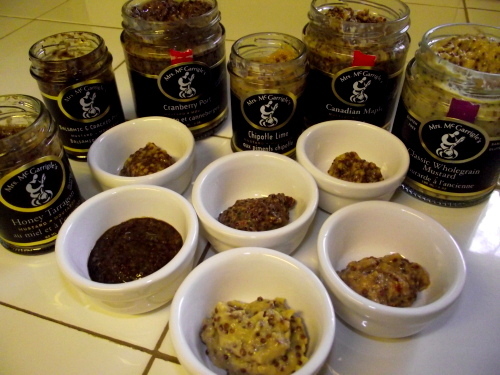 Janet Campbell’s products (mustards, chutneys, sea salts and preserves to name a few) can be found in shops across Canada and yet are still made lovingly by hand in small batches in the 540sq ft kitchen attached to her retail outlet in Merrickville Ontario. 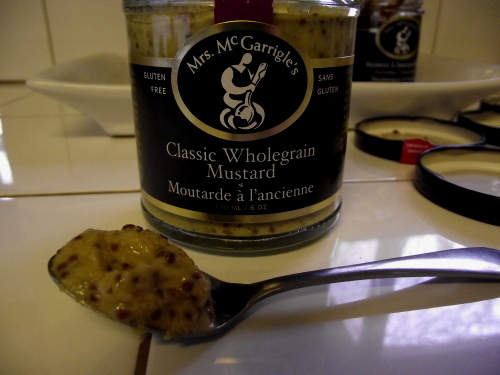 Oh, and did I mention that FIVE of her 14 mustards have been award winners at the World Wide Mustard Competition? Yeah. That’s a passion for well made artisan goodness. Great bite from the mustard and the perfect “pop” from the deeds, the maple adds a surprisingly sweet note to the shape flavor of the mustard. I imagine it would be terrific slathered all over a whole baked salmon. HOT! I love hot when it has a real purpose and this is the perfect example. I’m going to try it this weekend with seared scallops and some Thai chillies with a little coconut rice to cool the flames. This one is not for the faint of heart. 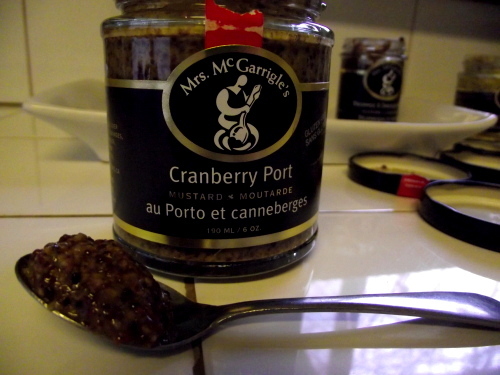 Cranberries, Port and Mustard? Oh yeah. 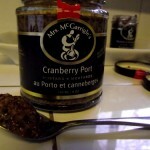 It has the depth of silky port and the brightness of fresh cranberries. 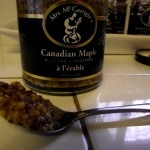 My husband and I ate half the jar the other night as an accompaniment to a platter of meats & cheeses & bread. This one is exactly what it should be. The perfect burst of seeds amid the sharp bite of a well made classic flavor. I can’t think of anything that this one wouldn’t go with, everything from a ham glaze to a giant sandwich. I am a huge tarragon fan and this one I think was my favorite. 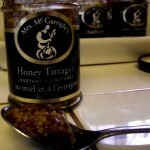 That distinct tarragon taste with just a hint of sweet honey. Tarragon can often be overpowering but in this case, the flavor is subtle and unbelievably fantastic. 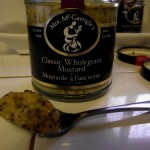 The very day that this box of mustard arrived I busted out some chicken breasts for this particular jar of love. Janet thoughtfully included a fantastic recipe book using her mustard and I felt the need to create my own! It was sublime. You have to taste this blend because I can’t even describe how good it was. In a large oven safe skillet saute the onions in olive oil & butter on medium heat until transparent. Add garlic and cook for an additional 5 minutes and then remove and set aside. 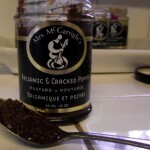 Pat chicken dry, season with salt & pepper and then slather those babies in the Balsamic & Cracked Pepper Mustard. Drop into the same pan the onions were in and cook for about 4-5 minutes per side depending on thickness. The smell of the mustard in the hot pan is freaking incredible!!!!! 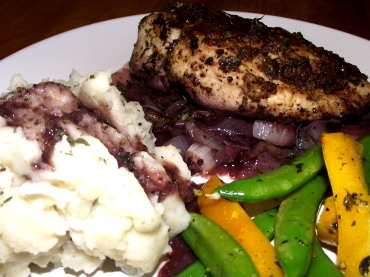 Remove chicken and set aside with onions. De glaze the pan with the red wine and continue to cook until it’s reduced by half. Make sure you are scraping the bottom well to pick up all of the yummy-ness left behind by the onions, garlic, chicken & mustard. Once wine is reduced add chicken back to the pan, place onions around the breasts and bake covered in pan for 15-18 minutes on 350. Serve with veg & mashed potatoes, making sure to spoon red wine/mustard cooking juice over both chicken & potatoes. 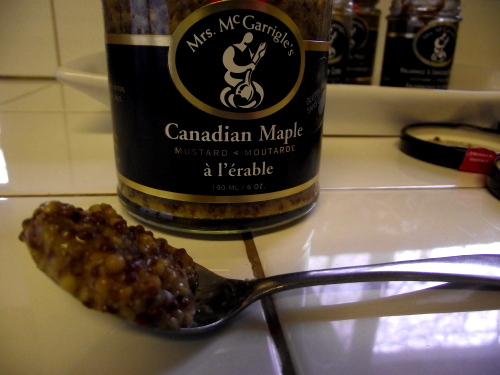 Oh, and if, given the fact that this mustard aficionado is called Janet Campbell, you’re wondering about the name Mrs. McGarrigle’s, you’ll just have to stop in and ask her while you’re perusing the aisles of fine foods and artisan treats. This chicken is fantastic! 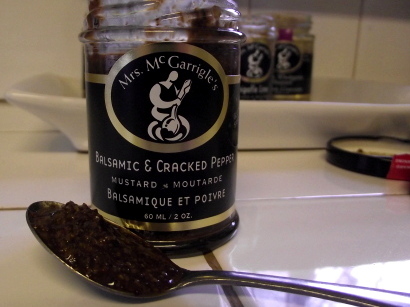 And I am an not a good cook~ Just so you know, because my husband raids the fridge to make super duper hockey night sandwiches, I ran out of Mrs.McGarrigles and used a ‘bulk’ brand the 2nd time I made it. Total fail. Its this particular mustard [balsamic] that gives it all the flavours and interest. 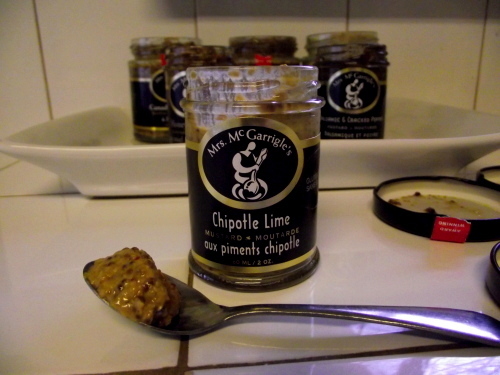 I now buy it at Vinces market in Uxbridge and hide it behind something that looks healthy so I know it will be safe! Hi Nancy- Glad you liked the chicken & I know exactly what you mean about trying a different mustard with it- it’s just not the same!! The company contacted me after this post & apparently they’re including the chicken recipe in their next book of mustard recipes!!! !